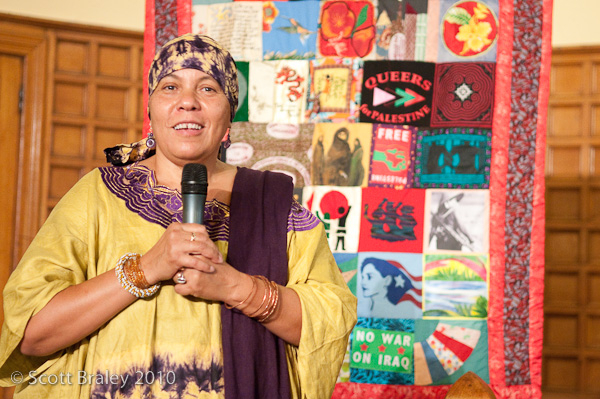 In response to mgwizard‘s wish: “greetings to all who are attending the Memorial for Marilyn today in Oakland — we look forward to hearing about this gathering, seeing photos, and hearing the poems said and songs sung — please share with Marilyn’s many other friends around the world” here is the first photo of Mama Ayanna of Oakland opening the gathering with a libation to the ancestors and the earth. More to be posted soon. Thanks to all the folks who put together the beautiful memorial for Marilyn last night. it was a powerful outpouring of love and remembrance. Marilyn gave so much to the world and to each of us who had an opportunity to know her. She will not be forgotten, and we will all carry on her mission for justice and peace. This is so beautiful —- all of the photos posted from the memorial are great, but this one makes me smile — thank you so much! !